Our Green Tea Ginseng tea box contains 20 large tea bags. All of our teabags contain 3 grams of tea, DOUBLE the size of most teabags on the market, so you can enjoy more of the flavor, nutrition, and energizing effects of Yerba Mate! American Ginseng root, Fresh Green Yerba Mate, Premium Japanese Sencha Green Tea, Echinacea Angustifolia Root and Echinacea Purpurea leaf. Our most powerful tea ever. One taste will enlighten you to the delicate but powerful blend of this tea. Organic Green Tea Ginseng Mate smells like socks! Yet…I’m giving it between an 80 and an 81 on my personal tea tasting scale! How can I rate something that high that I think smells like socks, you ask…keep reading!!! FIRST…You know me! I have too look things up! I should really buy stock in Google AND Wikipedia! When I first saw the ingredients I wanted to learn more about the root and leaf they used in this! This is quite good…much better than I anticipated, actually! I don’t know why I waited so long to try it! The Ginseng with the Echinacea as 2nd and 3rd’s to the Yerba mate was genius! 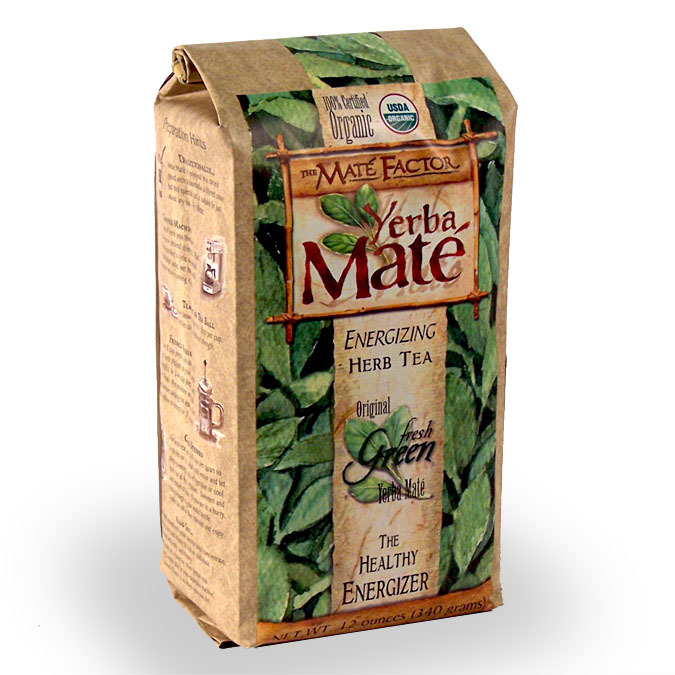 The Yerba Mate toned down how medicine-E everything else tasted and it works out pretty well! This DOES have a very pleasant taste! And it’s good FOR you!!! Our Tropical Lime tea box contains 20 large tea-bags. All of our tea-bags contain 3.5 grams of tea, DOUBLE the size of most tea-bags on the market, so you can enjoy more of the flavor, nutrition, and energizing effects of Yerba Mate! This amazing, fruity blend is not only refreshing hot or cold, but is an amazing booster to your body’s defense system. As I’ve said on numerous occasions, I’m not that fond of hibiscus. Some hibiscus in blends is OK so long as it’s not overdone – it provides an interesting tart flavor and a little bit of body to a tisane – but, when there is too much hibiscus in a blend, it becomes too tart and too thick and syrupy. In drinking this tea, I’m not sure if there is too much hibiscus here, or if it is just a tart tisane. The lime and hibiscus together create a rather sour pair. Nice if you enjoy sour or tart tastes, I’m not one of those people, though. That being said, this isn’t thick or syrupy, which leads me to believe that it’s not too much hibiscus, it’s just the combination of lime and hibiscus that creates such a tart experience. It has a nice body to it. And I found that a drizzle of agave nectar helped to turn this rather tart cup into something quite good. Interestingly enough, the earthy quality of the Yerba Maté in this blend cuts through some of the tart hibiscus taste, so I am getting more lime than I am hibiscus. Both the hibiscus and lime are still rather strong, but, the earthy nature of Yerba Maté saves this blend. And who’d have thought I’d ever be happy for the earthy characteristic of Yerba Maté? Certainly not me, not until now! But somehow, the blending of earthy and tart work together quite nicely. The tart cuts through some of the musty flavors of the earthy tones while the earthy flavor smooths out some of the tarter edges. It works together well. Now, I am not about to say that this is my favorite Yerba Maté blend, because it isn’t. But it is quite good and appealing in its own way. It is one that I would recommend to all you lovers of tart/sour tastes out there. Ingredients: American Ginseng root, Fresh Green Yerba Mate, Premium Japanese Sencha Green Tea, Echinacea Angustifolia Root and Echinacea Purpurea leaf. I was a little nervous to try this blend. I’m not crazy about the flavor of echinacea or ginseng; I find the flavor of these two herbs to be rather off-putting. So, needless to say, I don’t usually select teas with either of these ingredients, and this particular blend has both! Fortunately, however, neither of these herbs presents a strong flavor to the cup. The strongest taste to the cup is the green Yerba Maté, which is earthy and vegetative. Less than a year ago, I would have told you that I don’t care for green Yerba Maté because of its strong earthy and vegetative taste, but I really like Maté Factor’s green Yerba Maté! I contribute this change of taste preference to the fact that Maté Factor is dedicated to providing the freshest Yerba Maté possible. It isn’t smoked or aged Yerba Maté, and I’ve come to realize that this really makes a difference! I can also taste the fresh, bright flavor of the Japanese Sencha in this blend. It lends a sweetness to the blend that is distinctively green tea. Because of the green tea in this blend, I don’t recommend bringing the water to a boil like you might normally do when brewing Yerba Maté. This may scorch the tea leaves and cause the tea to taste bitter. Instead, I pull my kettle just as the water is producing a good amount of steam and there are tiny bubbles beginning to rapidly form at the base of the kettle – rapidly forming but not yet rising to the surface. As the tea cools slightly, more of the Ginseng and Echinacea tastes come through, but, surprisingly, it isn’t off-putting because the flavor of the Yerba Maté seems to offset it just “so” and gives it a very appealing taste. That being said, I think this tea is much tastier when it’s hot, served with a drizzle of honey. I’ve tried quite a few teas from Maté Factor now, and I’ve been very impressed. 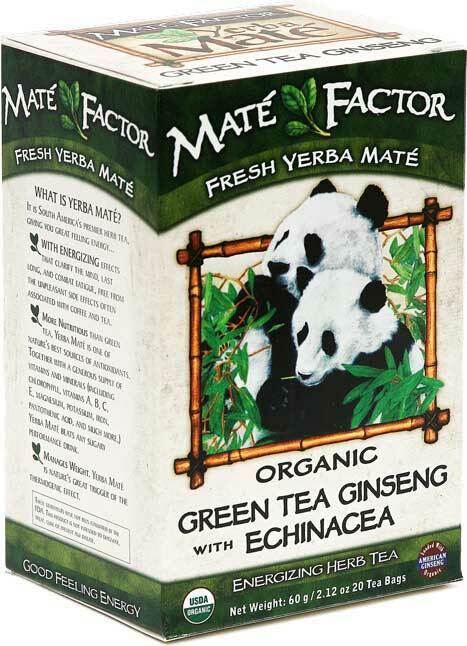 If you’ve been interested in trying Yerba Maté, Maté Factor is a good place to start. If you’ve tried Yerba Maté in the past and found it not to your liking, I suggest trying it again – but this time try a Maté Factor Yerba Maté! You may just change your mind about Yerba Maté. I know I have! Why Does Our Fresh Green Yerba Mate Tastes So Good? We do not age our Yerba Mate: All other yerba mate sold in the USA is aged for 1-2 years before being packaged, according to cultural traditions from Paraguay, Uraguay and Argentina. However, in Brazil, mate is commonly prefered as fresh as possible. The Mate Factor prefers this style, since it preserves the life-giving nutrients and the fresh green taste. Our Yerba Mate Process is an Art: We have spent years perfecting the “art” of creating delicately delicouse Yerba Mate. We have painstakingly learned the vast array of factors that control the final flavor and vibrance, in order to produce, The Mate Factor. No Smoky Flavor: We dry our Mate; using an art we have developed that preserves the natural flavor and also keeps our original green flavor Mate tea free from smoke. This low heat process protects natural enzymes that exist in yerba mate. 100% Certified Organic: We use one hundred percent certified organic Yerba Mate, responsibly grown without pesticides or chemical fertilizers, preserving the environment where our Mate is grown. People can change! Example: If you would have asked me a week ago if I liked yerba maté, I would have responded with something like: “I like yerba maté in some blends, and I like the roasted yerba maté, but I don’t really care for green yerba maté.” This is the stance I’ve held on maté for many years now, ever since I first tried green maté. Unflavored, unblended green yerba maté tends to be too earthy, vegetative and even somewhat smoky. It was a lot of everything that I don’t really care for in tea – I like a little earthiness to a tea sometimes, but, I’m not crazy about an overtly earthy tea. The same goes for vegetative and smoky qualities. And… green yerba maté tends to be all of these things… and not enough of something else to keep my interest. But… as I said at the start… people can change. I LIKE this yerba maté! And this is green yerba maté at its simplest – plain, unflavored, unblended green yerba maté – no fillers, flavors or other additives. After reading the information from Maté Factor about this tea, I understand a little as to why my taste seems to have done a complete 180. This is an unaged, unsmoked maté – just pure, dried leaf. In it’s purest form like this – green yerba maté is actually quite delicious. The flavor is light and rich. It’s a little earthy and a bit rustic. It has a fresh sweetness to it that is quite nice. It tastes a little bit vegetative. It’s really very pleasant and invigorating! It is refreshing to find a tea that totally changes my ideas about it. When I first received this tea, I was apprehensive. But now, I know – there’s nothing to fear when it comes to yerba maté! It’s delicious! Our Lemon Ginger tea box contains 20 large tea-bags. All of our tea-bags contain 3.5 grams of tea, DOUBLE the size of most tea-bags on the market, so you can enjoy more of the flavor, nutrition, and energizing effects of Yerba Mate! 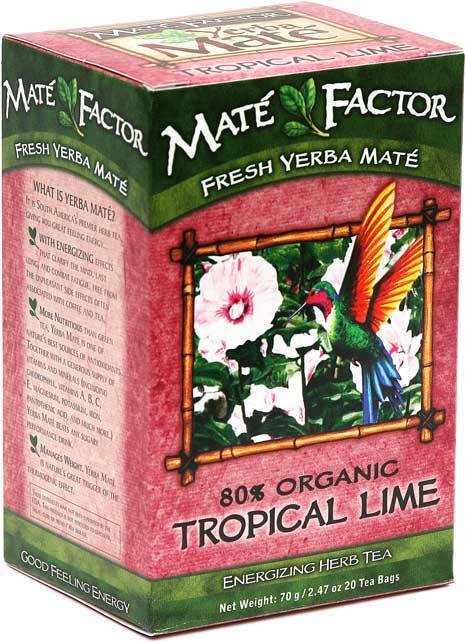 Mate Factor Lemon Ginger combines Lemon Myrtle and Ginger Root with our Fresh Brazilian Yerba Mate! This tea is a refreshing summer favorite! The Jaguar is a common wild cat in the subtropical forests of Brazil. It represents the agility and zest of our Lemon Ginger Yerba Mate. People often as me if I ever get “Tead-Out” with as much Tea as I drink…oddly, the answer is NO. i never get teaD out! I DO, however, get bored or sometimes just don’t want or care for a certain ingredient in a tea. But there are so many teas I NEVER get bored with tea as a whole. Perhaps that is why I ‘sat’ on this one for a while. First of all I’m not usually excited about teas with ginger in them. But I do like Ginger in foods. Maybe it’s because I feel many teas that featuring ginger in their list of ingredients tend to over-due it. Regardless…I tried this Lemon Ginger Yerba Mate recently and was pleasantly surprised! This one was much more lemon than ginger and I am very happy about that. This is lemony with a hint of ginger and tasty and refreshing! It didn’t leave a weird after taste and the overall experience was memorable not only as being a tasty tea/tisane but a tasty flavored Yerba Mate! The flavoring is “just right”!